50 Stunning Bridal Nail Art Designs to Rock at Your Wedding! Wedding season is here and we’ve got brides turning into bridezillas left, right and centre. Their minds are just one big chaotic box of wedding planning, prepping and 7649 other equally important things. But one thing that often gets shunned to the bottom of that list, or rather, put off till the last minute is getting your nails done. On your wedding day you’re going to be the subject of a countless pictures so wouldn’t you want to make sure that every little detail is spot on?! Those pictures are going to go down in family history so they need to be nothing less than perfect. So once you are done selecting that lehenga and deciding on how you want your make up, don’t forget to include your nails! Especially now that getting your nails done has evolved from just coating them with a layer of nail polish. 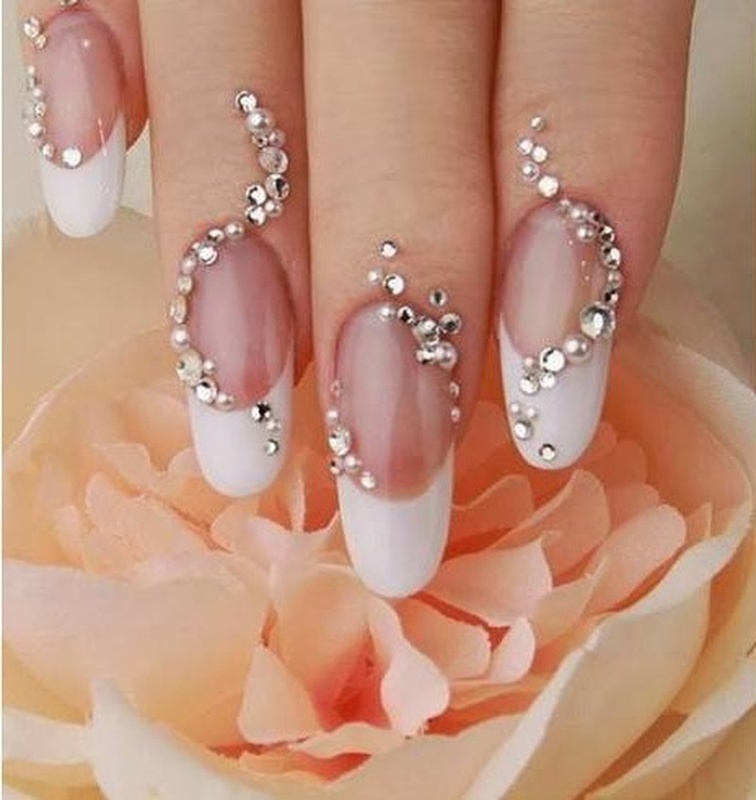 We know how stressful wedding planning can be, so take the load off of your shoulders, we’ve already put together quite an extensive list of 50 great bridal nail art ideas for you to check out and pick your favourite. We would advise you to book a special ‘nail-art’ appointment because well, art takes time! A delicate pink coat topped with sparkly crystals would make your nails feel like the princesses of the nail kingdom! Embrace your Indian side by incorporating these mehndi inspired nail art ideas. You could also match them with the mehndi design on your hands! The best way to rock this look is to incorporate splashes of vibrant colour. Though, you could always go for muted shades for a subtle look. Try out these creative French manicure designs for an elegantly chic touch to your nails! Neutrals and nudes happen to be trending this season so this is the perfect pick for the fashion-forward bride. Add a little glitter to glam up your nails! The colour delivers a sophisticated look to your nails while the patterns add an edgy touch. Again, embrace your desi side by getting some creative peacock inspired nail art designs to go with your Indian outfit! Contemporary brides only! Might be going out on a limb but hey, they’re definitely more fun that the usuals.